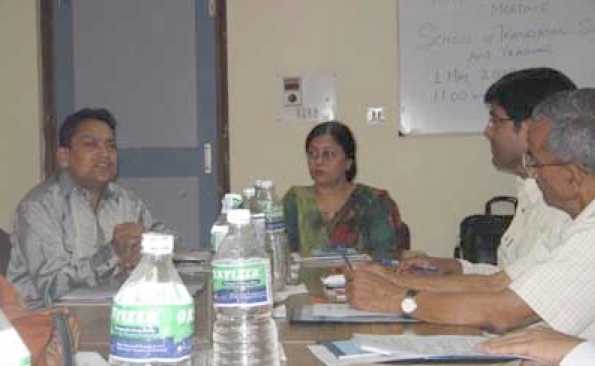 Specialist committee meet to decide on Bhojpuri Language Certificate Programme on 1st June 2009 in the Manaviki Vidyapeeth of IGNOU. Prof V.N.Rajshekharan Pillai, Vice Chancellor of IGNOU, inaugurated the meet saying planning for the course material for a language spoken by more than 20 crore people is very important. Bhojpuri is rich since ages in its literature and is spoken in nearly 17 countries of the world. Keeping in mind its rich tradition IGNOU started preparing its base course and that course is ready within a year. Prof Pillai said that the course material will be made available to the students from July 09 session and for this positive progress he praised Prof Shatrughna Kumar. Prof Pillai hoped that the sertificate course too will be prepared soon and work on graduation and post graduation courses in Bhojpuri will start in due course. The meet was attended by the Coordinator of the course Prof Shatrughna Kumar, Dr.Nagendra Prasad Singh(Patna), Prof Ramdev Shukla(Gorakhpur), Dr.Rajendra Pd.Singh(Sasaram), Prof Virendra Narain Yadav(Chhapra), Dr. Premsheila Shukla(Deoria) and Prof Rameshwar Mishra(ShantiNiketan) among others. Director of the Manaviki Vidyapeeth Prof. Renu Bhardwaj informed the meet about the preparation of course material for other languages being prepared by the Manaviki Vidyapeeth. Manoj Kumar Bhavuk, a wellknown Bhojpuri writer, and programing head of Hamar TV, attended the meet as media representative along with Kuldeep Srivastava, and KP Maurya. Posted by Devkant Pandey, Delhi on 1st June. Next Bhojpuri Social Groups are at war, it seems.